Is Godaddy India pushing customers to Drains to gain more Re-sellers. I am just wondering is Godaddy trying to push their existing Indian customer to drains. Since after the company shifted its focus to India and started with an Indian operation the service quality have gone down the train. After almost speaking to Ms Nidhi in March 2014, I today received call from them (YES AFTER 3 MONTHS), Mr Gaurav the executive wanted me to sign for re-seller program, but refused to share pricing, commission etc. My Question is how can you expect someone to sign for a program without knowing details, facts etc. The support@godaddy.com email is not functional. If you try sending them an email, no one will respond. Secondly, if you look at price the same product would have variable price like I was recently renewing couple of domains (all.com) one had 20% Discount, 35% discount and some had 15% discount. I had sent several emails to Godaddy but received no response. So my question is what are they trying to do. Build Customer or Kill Customer. The brand ambassador has no knowledge about domain/hosting, or does the company feel that in India you can sell domain/hosting like selling fairness cream etc. So now what do existing customer do, when they are clearly ignored. Where do they Go. I don't want to go to Net4India etc. So do we have another choice, please let me know. Godaddy new mantra for customers from #Godaddy to #Godada to #GotoHell. 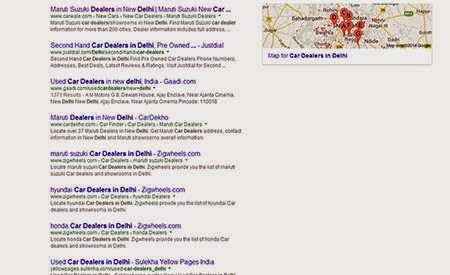 Is Google playing the Trick in name of algorithm! Mostly everyone related to Digital Marketing and other too are aware of Google Algorithm and knows about the changes that Google is bringing through regular update. I was speaking to couple of my clients and would like to share their value feedback, they feel that it has become difficult to find information on Google, i.e the algorithm have become so complex that it doesn't give required results to a customer. These portals have huge data and number of pages are in thousands. So technically they have one page for most common type of keywords. New set of pages and data are being updated every hour/day. These portal have cumulative information from various car manufacturing company. Data once updated are usually not updated like dealers address, phone number. Data are not offend verified too frequently. They will not list complete information. Similarly if you are searching for "Website Design Services", you would notice that at least for first 20 to 30 or may be 100 results you will not find one decent company. Most of these site don't have a portfolio - filled with junk or free template. If you are sitting in Delhi and looking for a information in USA, it is really difficult to get one. 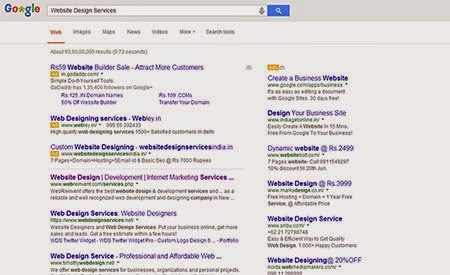 Is Google trying to create market for its Adword so that people shift to Adword, to drive traffic to their website. Why a small company cannot drive traffic to its website using organic search, even after having good content and architecture? Increasing the size of the website is the only solution to rank high and traffic through organic search. How do you drive traffic to a website? When Google is like a big guy, bulling you in a school. If you are looking for optimize your website for search engines the first thing that we need to do is generate a sitemap for the website and submit it to webmaster tool offered by Google or Bing (primary search engines). Over the years of my experience and search i have found several tools that would help you automatically crawl the website and generate sitemap, but I would recommend following two tools. They are handy and user friendly. Both are equally good and free, but there are the difference. Free Version support upto 500 page crawl. Don't keep a record of your last generated sitemap. Don't let you set a default priority value. Gives multiple file format of sitemap. Free Version currently support upto 3500 page crawl. Let you automatically or manually set priority value. Save's your last generated sitemap. Gives only two file format of sitemap. Quick Points after the sitemap is generated. Review your sitemap and remove unwanted link and pages. Check the page priority and modify it as per your preference.